Great news! It’s always exciting to see how the favorite app gets even more powerful. Can’t wait to update the version! For Mac OS X version: CMD+Q cannot close the app’s window. Use Command (âŒ˜) + Q to quit FDM and Command (âŒ˜) + H to hide the window. Great job! Any word on the Ubuntu build? Unfortunately, we are not planning to release a Linux build until a stable release for Mac OS X & Windows is out. However, we are doing our best to make sure that our source code is compilable under Linux to the extent that it will not be too big an issue when we get to it. Thanks for the speedy reply, and good luck! Missed the “set name” function. 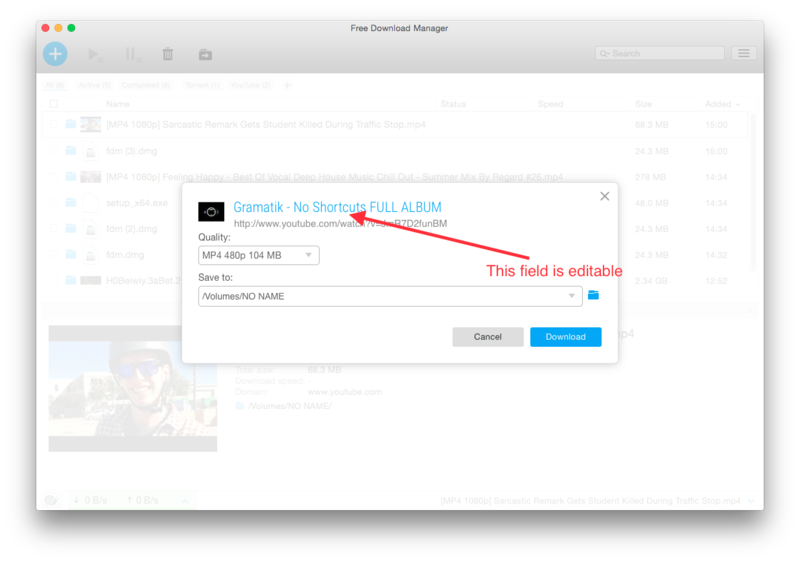 Then, adding a new file to download, I can just set the URL and destination folder, but can’t set the name. FDM can not automaticly catch links from browsers. New visual is well. What is the browser you are experiencing the problem in? What is your operating system / browser version? What exactly is not working, can you see the FDM context menu in the browser? Please make sure you have the corresponding extension installed and enabled in the browser. Also check FDM –> Settings –> Browser Integration and check the box next to your browser if it’s not already checked. Upgraded the FDM to 5.1.9 and it just hangs. Using Windows 10 Pro 64 Bit. Is this a known issue? Any solution available? Admin, oh, this is cool! I’ve missed that, big thanks! Does it happen immediately after you launch FDM or when you quit? Are there any specific things you do prior to FDM hanging? My internet connection has monthly quota limit, it’s vital for me to disable seeding torrents by default. How can I do that by default instead of right-click and disable the “enable seeding” option manually every time? Thanks for the awesome application! Is the since 2006 requested socks 5 proxy support finally added? This is a scam, download files are always corrupted or invalid. Having used Orbit for a while I have now switched to FDM for at least 2.5 years and like it! However, since moving on to Linux, FDM is one of the great programs I am really missing here. I would like to have FDM here, too, to offload downloading of files from the browser, as Firefox cannot be controlled in anyway and starts all downloads at once, blocking the whole line speed for browsing. Please bring FDM for Linux/Ubuntu/ZorinOS, as more Windows XP users are moving on to these (free, stable and secure) Operating Systems. ZorinOS (a Ubuntu Derivative) even has a Win7 and WinXP look-alike GUI (Graphics User Interface). All Operating Systems are also available in 32-bit and 64-bit, as well as in Educational Editions, too. Just try them. I have been installing a (64-bit) version on an external HDD and now I can use it on any (64-bit) PC by booting it up on USB! Looking forward to a Release of FDM for Linux/Ubuntu/ZorinOS, soon! 3. the FDM program version. Thank you for your suggestion, but unfortunately, we are not planning to release a Linux build until a stable release for Mac OS X & Windows is out. It’s impossible to disable seeding torrents by default at the moment. However, the feature will become available in Settings sometime in the future. SOCKS 5 proxy is currently not supported, but it’s on our TODO list. I am trying to catch links from Chrome, but your latest version of this fabulous downloader seems not to be syncing with the Chrome extension, hopefully you can fix this soon. Hello dev, thanks for the awesome software. I have a problem with FDM extension on Waterfox 46.0.1. I can’t seem to find a way to activate it. This happened after the latest update (3.9.7 build 1627). I’m on Win 10. Hope there will be a fix. Thanks. Is it possible to schedule downloads for a later time? I can’t see any way to do it. Thank you for your question! The feature is currently not supported, but itâ€™s on our TODO list. Where is the “Shutdown after downloads complete” function that used to be in the earlier version? The feature is currently not supported, but itâ€™s on our TODO list as well. Can u guys make a little sound to remind us the download files are already done? Since FDM only has system notifications for now, you will only hear a system notification sound if it is enabled on your OS. If you wanted a customizable sound notification, we’ll make sure to add it to our feature requests list. Unlike the 3.X version, 5.X no longer supports resuming broken/interrupted existing files on disk including from links that regenerate after a certain time, making using the software pointless. Stripping out the many 3.X features was not a brilliant idea either. Thank you for your report! Kindly provide sample URLs where you encountered the issue. Problem – not catching download links. FDM can not automatically catch links from the browser. – Is the integration with Google Chrome in the FDM settings switched on? – Is the FDM extension in Google Chrome installed? Is it active? – If during the FDM setup the browser was open, you have to relaunch it. It says ‘Support for all browsers’. Why is Opera not supported? Thanks. One of the features that I miss from the old version is the ability to have the downloaded file with the same date/time that it has on the server you download from. It was there on the old version and I cannot see it in the settings for the betas of 5.1. Thank you for your report! You can manage download priorities so that the available bandwidth is distributed between downloads depending on the download priority. Thank you for your report! The feature is currently not supported, but itâ€™s on our TODO list. How can I download the whole playlist from YouTube? admin It’s difficult to go into individual links and then paste them in FDM especially when I have to download in bulk. Sir, is there a way to resume broken downloads of FDM? It says “Connection time out” and doesn’t start anymore if I resume the file. Please send a broken link via support@freedownloadmanager.org to proceed. Our developers will do their best to resolve the issue. You seem to have lost the capability of mapping wildcard characters to do sequential downloads and I don’t mean in a BitTorrent, I mean in regular sequential downloads like Chaz1.zip, Chas2.zip, Chaz3.zip. I loved the old FDM! Please specify your request and send us the links you’re using. There is a problem on my laptop. After installation there are some hanged files and they’re getting stopped and asking for feedback. I reinstalled the application, but same thing is repeating. What shall I do now? – a screenshot of the ‘asking for feedback’ window.